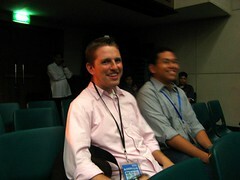 When Matt Mullenweg arrived, he sat right behind me, so I moved away and took a photo of him. I ended up attending sessions under the Development track. Kudos to Gail dela Cruz-Villanueva (Creating WordPress Themes & CSS Power), Markku Seguerra (Developing WordPress Plugins), and Karla Redor (WordPress as a CME/CMS). It seems many people missed sessions because of time constraints. And unfortunately there weren’t really any concrete demos from the Development Track talks to give you the feeling of how WordPress really works—except for Markku’s Strip! plugin, which was still very brief. But it can’t be helped. 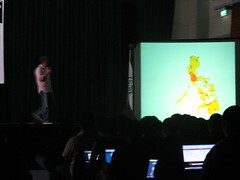 There are only so many hours in a day and the organizers (congratulations, Mindanao Bloggers!) and speakers made the most out of the situation. Overall, the topics were a good mix and it was difficult having to choose one over the other. Next time, I’ll choose the noob route. Matt’s much-awaited talk, The Future of WordPress (also State of the Word) was amazing, of course. 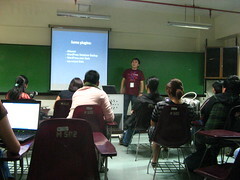 He discussed groundbreaking figures in WordPress usage. He also gave a tour of WordPress 2.7 “Crazyhorse” and discussed plans beyond this upcoming version. 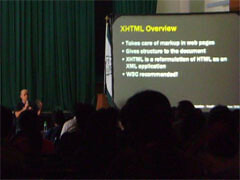 I loved that Regnard Raquedan‘s talk on WordPress & Web Standards was a plenary session. For those who were wondering why, I think it’s most apt. WordPress has been an upholder of web standards from the get-go. I’m sure many people have learned about proper coding conventions just by looking at the default WordPress theme files or at the HTML text of one’s blog posts. The Web Standards Project also transferred the Browse Happy initiative to WordPress as its official host and sponsor. I’m also glad he cited Aja Lapus, Mae Paulino, and me as references—though I hardly write about web standards here! On a related note, the three of us met with Shari Cruz to formalize plans the seemingly dormant Web Standards Philippines group. Give her a holler if you want to join. WordCamp was a great experience. My tiny wish is that in the future, participants would get rid of their shyness and keep the atmosphere very casual (maybe because it was too cold), but as close to an in-depth discovery of WordPress as possible. I can’t explain, however, why the auditorium was buzzing so loudly during the Powwow with Matt that he had to shush the crowd several times. I wonder what the Automattic team’s stance is on using WordPress as an e-commerce platform (e.g., using the Market Theme)? If they took interest in Andy Peatling’s BuddyPress, then a WordPress-powered shopping cart should be equally exciting. Where is the Filipino translation of WordPress? I’d like to grab a complete copy of tl_ph.po (the Tagalog language file). I have a very sparse one. Are there any translation teams out there? I can’t find any! WordPress.com has a very nice system in place for community-powered translating, but it seems just that—it’s for WordPress.com only. WordCamp = PlurkCamp. Almost everybody on a laptop that day was on Plurk. Also, everybody who had a question to ask had to mention their blog address and Plurk username. If you haven’t added Matt yet, you know his username. Why on earth did Matt carry that table onto the stage? I was really hoping they’d raffle off official WordPress goodies at the very least. Speaking of which, why on earth did I not ask Matt to sign my t-shirt? Maybe the WordPress store could sell stuff signed by him! I think I need a DSLR, if only to take decent photos in darker-than-daylight conditions. And a video camera. And an iPhone. Okay, I’ll stop. Shoutouts to J. Angelo Racoma, Jonel Uy, Jeff Villafranca, Wilson Tan, Paulo Urriza, ChiQ Montes, and Joni Ang (thank you very much for the Matt-and-me pic!). 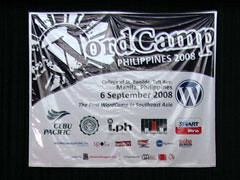 WordCamp Philippines 2008: A Success! Experiencing WordCamp Philippines 2008 by HereÃ¢â‚¬â„¢s to Life! I’ve tried WP-eCommerce for some sites, but I don’t think it’s the best thing to use. I hope somebody out there will come up with something better! And WordCamp was the perfect place to do it. A first in the Philippine blogging community, I think. Saw it! As for WP-eCommerce, yeah. I know I’ll open up a can of worms about getting WordPress to do something it wasn’t really meant to do, but who knows? see you again in the next wordcamp! Wow! Special mention :D Thanks. Yay! I see my post there! Definitely! And next time I hope I won’t have to disappear immediately. That’s also my wish for my self… hehehe! You might want to check out this thread (hope you have a Plurk account!). It seems we all want a very casual WordCamp too! Thanks for the shoutout! Whew! What a list of links! :( too bad my dad was scheduled for an operation on the very same day. thank God you were able to get my WordCamp freebies.